Traveling in the Peak District of England recently, I had the opportunity to visit Chatsworth House – the seat of the Dukes of Devonshire. (For a pop culture reference, check out the 2008 film “The Duchess”.) While I went mainly to see the historic home and beautiful gardens, I was pleasantly surprised to spot a meteorological instrument shelter and Campbell-Stokes sunshine recorder on the lawn behind the palatial house. Given their substantial stake in agriculture, landowners of the 18th and 19th centuries wanted a better understanding of weather and climate. Their extensive records helped build a foundation for what would later become the science of meteorology. Today, they provide detailed local climate histories. At Chatsworth, observations are still taken every morning at 9AM. PWS at Chatsworth House, Derbyshire, England. Credit: Melissa Fleming. The Thames Barrier protects millions of people and billions of dollars worth of property in greater London from flooding. As a New Yorker who experienced Superstorm Sandy and its record storm surge first hand, I made a point to visit this crucial piece of engineering during a recent trip to the UK. Completed in 1982 at the cost of £535 million (about £1.6 billion today), the barrier was built in response to the catastrophic North Sea Flood of 1953. Often called the worst natural disaster to hit the UK, the floodwaters claimed the lives of 307 people and caused widespread damage estimated at £50 million (£1.2 billion today). According to the UK Met Office, the deadly flood was caused by the combination of a high spring tide and an intense extra-tropical storm in the North Sea. Together, they generated a storm surge of 18.4 feet above average sea level. Moving upstream during the overnight hours of January 31, 1953, the high water overwhelmed the existing floodwalls and inundated communities along the Thames Estuary with little or no warning. Situated downstream of central London, the barrier consists of ten individual steel gates that span a section of the river that is 1700 feet wide. It is the second largest movable flood barrier in the world, after the Oosterscheldekering barrier in the Netherlands. The Netherlands were also hard hit by the 1953 storm, with over 1800 lives lost to floodwaters. When a storm surge or an exceptionally high tide is expected, all of the individual gates of the Thames Barrier are closed creating a solid steel wall, approximately five stories high, across the river. While this protects London from flooding from the sea, the barrier can also be used to help reduce fluvial flooding caused by heavy rainfall. When a high amount of water is forecast to flow downriver, the barrier is closed just after low tide. This creates a volume of space behind the barrier – sort of like a temporary reservoir – for the extra water coming downstream to fill. Without the barrier, the incoming tide would take up this space and cause the river water to rise even higher and spill out of its banks. To date, according to the UK Environment Agency, the Barrier has been closed 176 times since it became operational 34 years ago. Of these closings, 89 were to protect against tidal flooding and 87 were to help alleviate fluvial flooding. At the time it was built, it was only expected to be used 2 to 3 times per year. Looking ahead, as the climate warms, heavy precipitation events in the UK are expected to increase and sea levels will continue to rise. This means the barrier will most likely be called into action even more often. While there was debate about the feasibility and cost of building the barrier, as there is with any large government project, it has repeatedly proven itself to have been a worthwhile investment. It is expected to remain a viable flood defense tool through the 2060’s. The Thames Barrier protects London from flooding. Credit: Melissa Fleming. The River Thames is as much a part of London as the buildings and palaces that sit along its banks. During a recent visit to the UK’s capital city, I learned more about this storied river and its long history of flooding. London is situated along the tideway – the part of the Thames that is subject to tides. As such, it faces a flood threat from exceptionally high tides and powerful storm surges sent up river from the North Sea. Heavy rains that fall west of the city can also send torrents downstream. Today, the mighty Thames Barrier protects the city against massive deluges, but an older flood warming system is still visible along parts of the river. These are the bronze lion heads that line both sides of the Thames at Victoria Embankment in central London. Installed in the late 1860’s as part of the Great London Sewage Works project, they are often overlooked today as decorative moorings. Bronze lion heads line the wall of the River Thames, London. 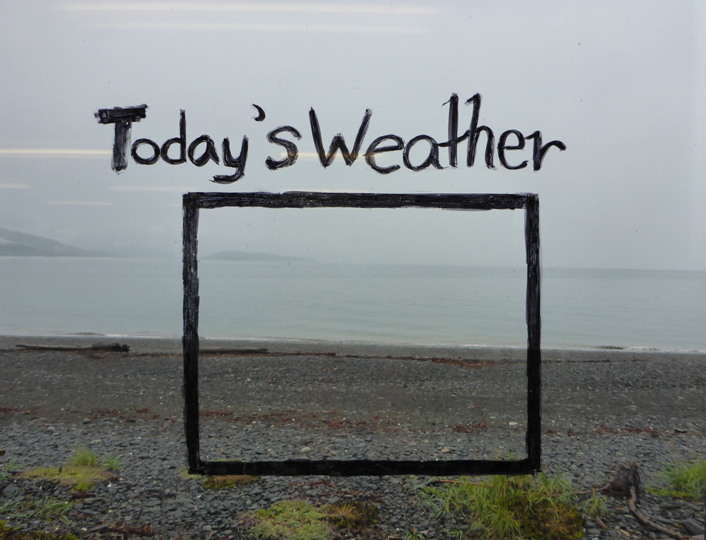 In Iceland, people are fond of saying, “If you don’t like the weather, just wait five minutes.” This popular expression is written on everything from t-shirts to coasters, and during the course of my recent visit I also found it to be true. The notoriously changeable weather of this island nation is largely the result of its location. Situated just south of the Arctic Circle, Iceland sits at the border between the Arctic Ocean with cold air masses to the north and the Atlantic Ocean with milder air masses to the south. A branch of the warm Gulf Stream Current known as the Irminger Current also flows along the country’s southern and western shores moderating the climate. As this mild air interacts with cold arctic air, it produces frequent changes in the weather. A relatively mild, sunny day can quickly turn cold and rainy. Strong winds are also very common. So, when in Iceland, heed the advice of the locals and be prepared for all four seasons on any given day. Situated high is California’s Sierra Nevada Mountains, Sequoia National Park protects the only place on Earth where giant sequoias – the world’s largest trees by volume – grow naturally. Air pollution, however, does not recognize the boundaries set up by the National Park Service (NPS). While hiking there recently, I learned more about the air quality issues facing this national natural treasure. According to a recent report by the National Parks Conservation Association, Sequoia National Park received an “F” for air quality. While other parks in the NPS system also have air quality concerns, Sequoia NP was rated the worst in the nation. In 2014, its Ash Mountain monitoring station recorded 56 days where the level of ozone was above federal health standards. In most parts of the country, air quality issues are often connected to emissions from coal-fired power plants, but in California there are a few other factors at play. While the region’s notorious wildfires do create some air quality problems, the NPS says the vast majority of the pollution in the park comes from human activities outside its borders. With a prevailing westerly wind in the region during the summer months, emissions from large-scale industrial and agricultural activities as well as massive amounts of vehicle exhaust are swept eastward from San Francisco and across the San Joaquin Valley. Trapped by the topography of the valley, the polluted air is heated and forced to rise up to the elevation of the park. Pollutants found in the air include nitrogen oxides, ground level ozone, fine particulate matter, and traces of pesticides. Of these pollutants, ground level ozone, which forms when nitrogen oxides react with heat and U.V. light, poses the most serious threat to human health. It is known to cause a variety of repository problems and is often the reason given for air quality alerts. It is also harmful to plants and trees – the organisms that are supposed to be protected by the park. While ozone does not seem to be impacting mature sequoias, the NPS says experiments have shown that it is stunting the growth of sequoia seedlings. That said, other trees in the park, such as Ponderosa and Jeffrey Pines are feeling its full effect. Damaging their stomata – tiny pores on their needles that usually absorb carbon dioxide -the pollutant reduces a tree’s ability to perform photosynthesis and therefore its ability to produce and store food. As a result, they are weakened and more susceptible to disease and insects. The telltale sign of ozone damage is the yellowing and thinning of a conifer’s needles. Air pollution is also responsible for the smog that obscures views in the park. On a clear day, according the NPS, the view from Beetle Rock – which is about 6,200 feet above sea level – extends for more than 100 miles. In summer, when the smog is worst, that view is often significantly reduced. The good news is that air quality issues in the park – like much of the rest of the country – have improved in recent years as a result of measures associated with the Clean Air Act. The bad news is that it still remains a serious problem. Seeing that our actions can make a difference, we can continue to reduce air pollution by conserving energy and reducing emissions – a similar strategy to reducing the impacts of climate change. Fueled by drought, wildfires have been blazing across the American West all summer. Sixteen are currently burning in California alone. While hiking in Kings Canyon National Park in the state’s rugged Sierra Nevada Mountains recently, I crossed paths with the “Rough Fire” and saw it produce a billowing pyrocumulus cloud. Pyrocumulus clouds form when intense heat at the surface – usually from a wildfire or volcanic eruption – causes air to rise rapidly. As it travels upward, water vapor in the air condenses into droplets and forms a cloud. Filled with ash and smoke, the swelling cloud generally appears more grey than white. Ignited by lightning over three weeks ago, the Rough Fire continues to spread and has even caused parts of Kings Canyon National Park to close. According to the NPS, smoke from the massive fire has also impacted the air quality in and around the park. To date, the fire has charred close to 50,000 acres and is only 17% contained. 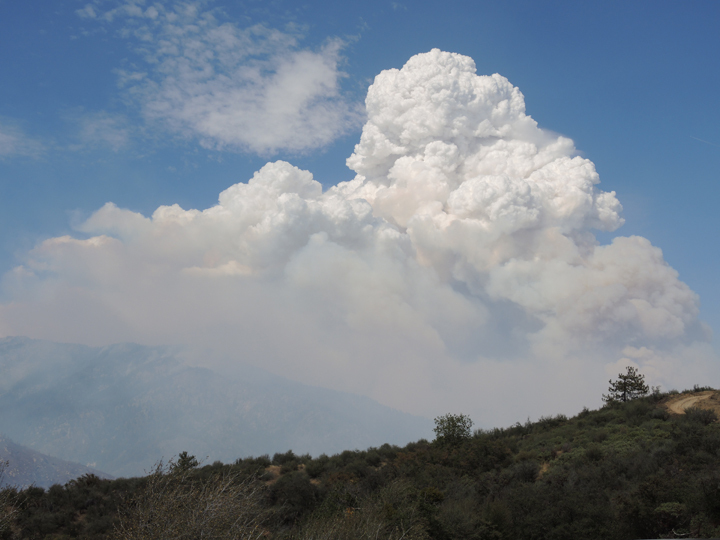 Pyrocumulus cloud rising over California’s Rough Fire in Sierra National Forest and Kings Canyon National Park, August 2015. Credit: The Weather Gamut. The saguaro – the classic symbol of the American southwest – is the largest cactus species in the United States and only grows in the Sonoran Desert. 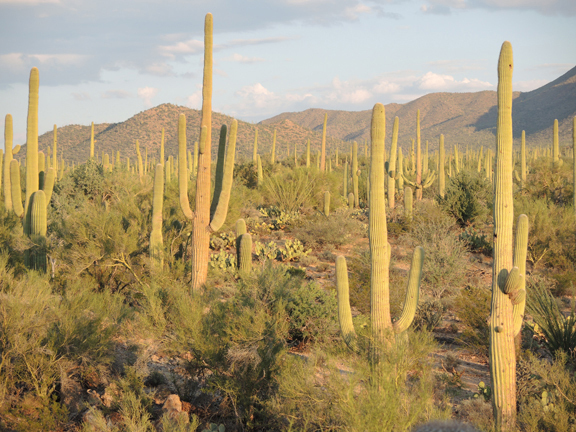 Straddling the city of Tucson, AZ, Saguaro National Park protects over 90,000 acres of its namesake cactus. While visiting there recently, I learned how this unique environment is being impacted by climate change. The Southwest is the hottest and driest part of this country and climate change is making it even more so. According to the US National Climate Assessment, 2001 through 2010 was the region’s warmest decade on record with temperatures almost 2°F above historic averages. 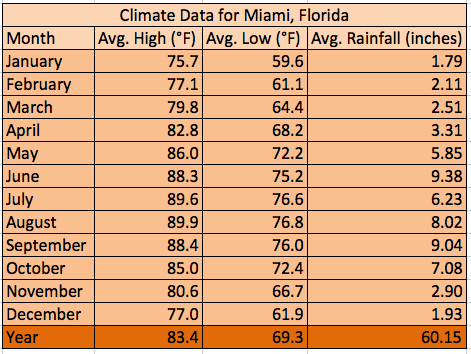 Looking ahead, the report projects continued increases in average annual temperature and a decrease in precipitation, especially in the southernmost part of the region. In a National Park Service (NPS) report on arid lands, the agency says it has already observed a widespread winter and spring warming trend and a lengthening of the frost-free season in the Sonoran Desert. These warmer conditions are causing a variety of environmental changes in Saguaro National Park. While fewer cacti are dying from severe freeze events, evaporation rates are increasing, making an already parched area even drier. “Arid ecosystems,” the NPS says, “are particularly sensitive to climate change and climate variability because organisms in these regions live near their physiological limits for water and temperature stress.” Even slight changes in the environment can dramatically alter the distribution and abundance of many desert species. On average, the region currently receives less than 12 inches of rain per year. The phenology, or the timing of natural events, is also being thrown out of sync as the climate changes. The vital rains of the region’s monsoon season traditionally begin in early July, but are projected to arrive later and later in the coming years. This can be a problem for the saguaros, because they have evolved to produce fruit in the beginning of July. While adapted for the dry desert environment, the cacti still depend on adequate rain during the summer growing season for both their own survival and the establishment of seedlings. Another serious climate change challenge for the Sonoran Desert is the spread of non-native plant species. Buffelgrass, a native of Africa, was introduced to Arizona in the 1940’s for cattle forage. Thriving in the heat, this invasive species is crowding out the native plants (including the cacti), changing the look of the landscape, and increasing the risk of wildfires. The Sonoran Desert did not evolve with fire as an ecological factor. Lush with vegetation by desert standards, the region usually had large gaps between groups of plants. This helped keep any wildfires small. Now, as the buffelgrass fills in those open spaces, fires can burn hotter and spread much more easily. Adding insult to injury, the buffelgrass grows back after a fire has killed the native plants. The changing environment is also problematic for the animals that depend on the saguaros for food and shelter. These include a wide array of species, ranging from woodpeckers to coyotes. Scientists are continuing to monitor and research how additional changes in temperature and precipitation will affect this beautiful and unique place.